Amstrad SRD510/520 (540/545/550, SRX310/320) Frequently Asked Questions. Q.1) How do I disable the internal decoder ? Q.2) Can I add channel up and down buttons to the front panel ? Q.3) What is the SIS feature and what does it give me ? Q.4) How do I connect an External decoder to the 510 ? Q.5) My Power-Supply is faulty - what do I need to repair/upgrade it ? Q.6) Will MAC work with the 510 ? Q.7) What does that 'C' switch on the bottom of my 510 do ? Q.8) What are the most common faults and how do I prevent them? Q.9) Where can I buy any spare parts for my 510 ? Q.10) How do I receive Astra 1D channels ? Q.11) Doesn't a Universal LNB also switch to a higher band ? Q.12) Can I modify my SRD510 to watch digital channels ? Q.13) Can I have more than 99 channels on my SRD510 ? Q.14) What do I do if my receiver does not seem to work properly or the channel frequencies are mixed up? Q.15) Where can I obtain a new/replacement/additional Amstrad SRD 510 receiver ? (Q.16) Why does the UP/DOWN selector not repeat when I keep it pushed down? (Q.17) There is a little circuit connected to the front Standby/ infra-red sensor board. What does it do? (Q.18) What is an ADX? (Q.19) Can I fit a 22kHz tone generator inside an SRD510? (Q.20) Where can I get even more information about repairing receivers? (Q.21) How can I prevent failure of my receiver? (Q.22) What should I do if water gets spilt inside? (Q.23) Can I use my SRD510 with a motorised dish? (Q.24) Will any other remote control work my SRD510? (Q.25) Why do I see a flashing LED(s)? (Q.26) Can I upgrade to a 2 input tuner? (Q.27) Can I upgrade to an Enhanced LNB? (Q.28) What does the SRD550 have that's different? (Q.29) Can I use the SRD510 as an external decoder? (Q.30) What are these decoder spots? (Q.31) Why are the pictures dull / low contrast? (Q.33) Why does it scramble MTV or VH1 ? Q.1) How do I disable the 510's internal decoder ? Attach flying lead out of plug to pin 8. I have been told that this modification works for most IRDs with external decoders. Some require the 8pin voltage for enabling/disabling - some don't. Q.2) Can I add Up and Down buttons to front panel ? Q. 3) What is SIS feature and what does it give me ? The upgrade is a very simple one to do and makes your Amstrad 510 think its a Amstrad 520 receiver - giving all of the 520's features if you also do the Up and Down button upgrade too ! Find the largest chip on the main board and connect a wire link between pins 4 and 20 on the chip (this is the row of pins closest to the rear of the receiver). I found the easiest way to do this was to remove the chip from the holder and solder the link on, using a heat shunt so you don't fry the chip with the soldering iron. You could always remove the complete board and solder the link between legs 4 and 20 of the IC holder - but I found the board hard to remove due to hot-melt adhesive (some versions use a type of "Evo-Stick" which is even worse. Hot-melt adhesive can be softened with a hair dryer). A friend of mine has also done this modification using silver conductive paint - the type used for repairing broken PCB tracks and says it works just as well - apart from 'grafitti-ing' the chip with silver paint ! When you next power the receiver up, you will find the SIS Index enabled - showing you the list of channel names and a marker - move the marker up and down the list with UP and DOWN on the remote and press EXIT when you reach a channel you want to view - ideal for when you forget channel numbers. The 'LNB A / B' switching puts an extra line into the setup screen - DISH - and when Dish B is selected, Pin 14 of the Decoder SCART has 12 volts put on it, Dish A gives 0 volts. This is selectable on a per channel basis and can be used to enable/disable an ADX converter, etc. or other decoder.. If you carry out the modification, you will find that the Channel Lock feature in the Channel Setup menu is also enabled - meaning 'locked' channels can only be accessed with the remote handset - not the channel change buttons - a crude way of parental locking (if you hide the remote that is !). You can tell a locked channel - the screen goes red and the words 'locked' appear. This is quite easy to do - mainly involving wiring a SCART Plug up for the decoder socket and enabling it but does not work for decoders that require a baseband signal input - this includes MAC or some Luxcrypt decoders. Wire the 8pin on the Amstrad's decoder port to the input that 'enables' your decoder (Pin 8 again possibly !) and also attach a flying lead out the satellite decoder ports pin 8. You may need this flying lead depending on your decoder type. Depending on your decoder type - the 8 pins enable the decoder to start decoding and also tell the Receiver to accept incoming video and audio from your external decoder instead of the internal decoder. Q. 5) My Power-Supply is faulty - what do I need to repair/upgrade it ? SRD650 uses a 150uF/400v capacitor in place of 69uF/400v. THIS INFORMATION IS GIVEN FOR QUALIFIED ELECTRONICS ENGINEERS ONLY! The parts listed are SAFETY CRITICAL PARTS and should be replaced only with parts from an approved kit. This is no joke. It is not a "con" to get you to buy a kit. There is real danger involved! Check internal mains fuse by measurement, not just by looking! You may need to pull off the glued plastic cover. 1. Replace T1.25A fuse with the identical type. 2. Change C600 (1uF) to 220nF Mains Voltage rated! (RS part no- 115-203). This problem can be caused by severe mains interference as a result of faulty mains wiring or a nearby electrical appliance with a large motor (such as a lawn mower, drill or vacuum cleaner). You are advised to find the external cause: check wiring in plugs and sockets. Don't plug heavy duty electrical equipment into the same ring mains supply. 1. REMOVE MAINS CONNECTION AND DISCHARGE BIG ELECTROLYTIC CAPACITOR ! 2. Fit RELKIT 3 parts. 4. Check D607 for short-circuit. If shorted replace with uprated type BZY95A or B.
R608 (220ohms), R611 (1k ohms) and ALL diodes. If ANY of these are faulty then replace IC600. These parts are supplied as SATKIT 3A but you MUST fit RELKIT3 first. itself is faulty and TR600 may NOT be. have been degraded by excess current through the faulty diode. Replace C611 (1uF) with 10uF/50v/105~C type. cause the demise of the components you DID replace, at switch-on! 6. When you are sure that all faulty components have been replaced with the equivalent or uprated type, plug in and try again. If it still won't light (maybe pulses or ticks - voltage on D608 cathode goes up and down) then the transformer T600 is probably faulty. DC voltages to be too high. Be sure to measure them. Solder a wire from the little metal box (front of power supply board) to the test pin marked "0v" on the card-reader board. (On receivers with no Videocrypt decoder, solder the wire to any corner of the tuner module or the RF Modulator box). Connect a voltmeter with negative probe stuck through the tuner earth braid and positive probe touching the power supply connector on the main board - third pin from the front. Connect the LNB and switch the receiver on. IMMEDIATELY adjust RV600 on the power supply board until the voltmeter shows 4.95 volts. This modification prevents all sorts of intermittent faults such as remote control not responding, squealing noise, red & green LEDs flashing when receiver is warm, going into standby on its own, etc. Use a very short SCART to SCART lead, preferably with only 9 wires, not 21. Label one plug "Receiver end" and remove its cover. Pull out pin 12 and discard it (cut it off). (The pins have a tiny securing tag which needs to be pushed aside with a sharp point). Pull out pin 19 and push it back into position 12. (The Mac de-emphasised signal comes out of number 12 on the decoder socket). Replace the SCART plug cover. DO NOT select "Mac" in the menu! This will cause loss of sound on ALL channels the next time you switch the receiver on from standby. The audio is automatically routed in from the D2Mac decoder with "PAL" selected as normal. However your D2Mac decoder should have "Mac" selected in its menu (if this option exists). Note: Pin 10 on the decoder Scart socket gives FLAT baseband so use this instead of pin 12 if your decoder needs it. 'Decoder' and the other 'Receiver'. sharp point). Pull out pin 19 and push it back into position 12.
and not MAC or you'll get no audio whatsoever. good range of square push-switchs that match the 510 quite nicely. which is constantly being fed from pin 8 of the TV SCART socket. 12 volts rather than using a manual switch. Q.7) What does the C-Band switch underneath my 510 do ? Try it and see ! You will notice the switch through a small cut-out labelled "C - whatever" - Doing this inverts the video signal to make it compatible with C-Band LNB signals. This switch could be useful if you have C-Band receiving LNBs fitted to your system - (looks like Amstrad had other uses for the 510 besides Astra/Eutelset...etc. I would be interested to know if anyone has success with this.) and also can improve/worsen undecoded Luxcrypt pictures. Unfortunately, it also causes "blank screen" faults so it's best to desolder it and fit a wire link! (8.1) The most common fault is power supply failure. 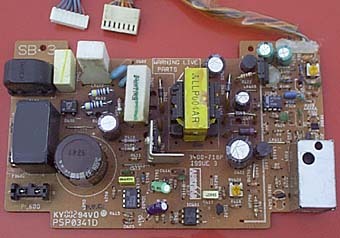 Read the power supply repair list and replace the two high-voltage 47k resistors. Also replace the capacitors listed. Add the wire as described and adjust the voltage. (8.2) The next most common fault is loss of picture or very weak picture caused by failure of C54 on the main board next to the power supply connector. Replace it with a 100nF. (8.3) No audio, just hissing noise. Usually caused by a bad soldered connection on the surface mount chip beneath the main board. Leave this to the experts! (8.4) Intermittent blank screen. Picture comes and goes if unit is tapped. Bad solder joint on C55 next to the upright "daughter" board. (8.5) No decoder messages. Picture remains scrambled. Try unplugging from the mains for a minute. If this doesn't cure it then the fault may be inside the decoder box or the daughter board. (8.6) Sparkly pictures. Lots of causes! If your dish, cable and LNB are OK, make sure that you have video deviation set to "Narrow" not "Wide" in the menu. If sparklies are only black or only white (not both) then your tuning may be incorrect. (8.7) Red and green lights flashing on and off simultaneously: indicates a short-circuit cable or no LNB voltage. If it only happens when warm, add the wire as described previously. If it stops when the LNB cable is disconnected, the cable, connector or LNB has a short-circuit. (8.8) Red and Green lights flash alternately: indicates Standby button is held in when mains is applied. Sometimes carbonised glue on the Standby button solder joints will cause this. Sometimes standby button is jammed. (8.9) Pictures only black and white bands swirling about. Make sure that C-Band switch underneath is in the "normal" position. (8.10) Receiver goes to Standby all by itself when warm. Black, carbonised glue on Standby button solder joints. Scrape it away. Another cause is loose connections in the power plug! (8.11) "Your Card is Invalid" message with no card in the slot. Faulty switch contacts in the back of the card reader. Lift out the card reader board, remove the two tiny screws which hold the card reader to the board and prise off the top moulding, carefully. Clean the switch contacts with WD-40 and make sure that all the card contacts are clean and in line with each other. (8.12) "Your Card is Invalid" message only with card in the slot. Test the card in another receiver. Make sure it's the right way up/round. Spray the card contacts with WD-40 and push it in and out of the slot a few times. If fault remains, replace all 8 1N4148 diodes on the right hand side of the card reader board (two rows of four). If fault remains, replace card reader board completely. If fault remains, replace decoder box. Alternatively, order the "Repair Manual". You need a frequency shifter called an "ADX". The standard type moves EVERY channel higher by a count of 500. However, this presupposes that your standard LNB will receive the Astra 1D frequencies (often it will not - or not very well). A better way is to fit a new "Universal" LNB on your dish and use an "ADX PLUS". This works like an ADX but also has an internal switch to make it shift all channels DOWN by 500 if you wish. Now a Universal LNB moves the channels UP by 250 and the ADX PLUS moves them DOWN by 500 so the result is to move them all down by 250! Well, the result is that you have to retune your receiver for every channel. With the ADX PLUS switched OFF the Universal LNB will send the Astra 1D channels up by 250 so that's where you tune them. With the ADX PLUS switched ON, the rest of the channels will be 250 lower than the magazine listing. Most suppliers of ADX PLUS's supply tuning details - usually they are correct and contain a Channel Guide with what to expect and where ! You can switch the ADX automatically by fitting an "AutoSelect" unit inside. This produces the "dish A/dish B" option in the menu but also provides enough current to drive the ADX switch via the decoder SCART. (Sometimes if you simply add the wire to the microprocessor as described previously, the current drain of the ADX might be too high for it to operate reliably). There is just enough room to fit an ADX inside the 510 - you need to drill two holes in the rear of the plastic case and fasten the ADX using its F-socket nuts. If your ADX has a plastic body, remove this to leave a tin box with the two F-sockets and switch and LED exposed. Do not take the tin box apart - all components are fragile, surface mounted and non-repairable. All wiring (except for a small coax link from the ADX to your original LNB input) can then be done inside your receiver to leave a neat job. This conversion has been advertised by "510s R Us" (Mildenhall Satellite 01638 712345) for more than a year and a half. They will do it for you if you wish. Also, see "TELEVISION" magazine page 280 of the February 1996 edition where the complete modification is described. Yes. If you feed a 22kHz tone to it, it will shift to a higher band so (in theory) you can watch other channels. On Astra most of these channels are planned to broadcast using digital compression. On other satellites you might see clear pictures. Yes, you can fit a later SRD540 microprocessor to give 199 channels. However, it does not have the "dish A/dish B" option. You must also fit the later channel memory IC to match. There is also another micro available which gives 199 channels, extends the tuning range so you can use an Enhanced LNB and gives an additional switching function (per channel) which you might use for a 22kHz tone switch! Q.14) What do I do if my receiver does not seem to work properly or the channel frequencies are mixed up ? Sometimes a "factory reset" will solve your problem if it's caused by something you've set wrongly in the menu or if the memory chip has been corrupted by interference. Try pressing "Standby" so the red light comes on. Then press "OK","SETUP" and "STATUS" - hold "STATUS" until the red and green lights flash. Your receiver is now reset as it left the factory. (Q.15) Where can I obtain a new/replacement/additional Amstrad SRD 510 receiver ? Since Amstrad now no longer produce the SRD510, many retailers (in the UK) are selling 510's for between 49 and 79 UK pounds, some including the dish pack and also offering the ADX upgrade for a small additional cost. (One of the latest models of Amstrads is pretty identical to the 510 with its graphics, SIS Index, etc...). Some still offer free-fitting if you take the Sky TV subscription. I purchased my 510 'second-hand' and also have two more used sets (Not for sale!). Some Satellite/Amateur Radio fairs have stalls that sell used satellite gear and some retailers who sell new equipment occasionally are known to take old receivers/equipment away when fitting a new one - so try asking around and offering what you think one is worth. So, the best thing is to look around, try the small ads in newspapers (usually regional/local or freesheets) and magazines (especially 'What Satellite' in the UK) and Usenet's 'satellite related' and 'for-sale' newsgroups. Happy hunting ! They also do Service Exchanges. I have no connection with them except that I have purchased units from them. (Q.16) Why does the UP/DOWN selector not repeat when I keep it pushed down? It's very tedious to re-tune the frequencies. You have a microprocessor from a different model. It is possible to re-connect the two standby buttons on the front panel so that they operate the up and down functions. Otherwise, you will have to do without. This was Amstrad's attempt to cure the "won't respond to handset" fault. It is supposed to square the IR sensor output pulses so the microprocessor will recognise them. However the REAL fault is caused by a bad 0 volt connection to the power supply. Adding the wire described above will cure the problem. You can remove the "bodge" circuit and increase the handset range from 4m to 6m. Sorry. I didn't explain it very well, above. It is a box which moves the band of frequencies from the LNB up or down - usually by 500MHz. SKY sell the "ADX-Plus" which they call the "Channel Expander." Yes, you can fit the Universal 22kHz tone board inside. Unfortunately, the only software switch available is the dish A/ dish B menu selection unless you fit the 199 channel special upgrade micro. A better option would be the twin input tuner conversion which will give you everything the SRD550 has! You can order Martin's "Satellite Repair Manual". Also "Satellite Secrets Revealed" (all about repairs and DIY installation) from SatCure (see (Q.9) for address). There's also a monthly column in "TELEVISION" magazine and one in "Satellite Trader" magazine. Keep it COOL! Most people treat receivers like pizzas - they like to keep them warm until they're golden brown. Do NOT put your receiver on top of a video, television or anything that runs warm. Do NOT shut it away in a so-called "Hi-Fi" cabinet (which is just an oven in disguise) unless you fit a fan. If you absolutely MUST rest it on something, build a little plinth with plywood. Glue four feet underneath and paint it matt black to make it look neat. There should be a minimum 100mm air gap above the receiver (warm air rises - it won't go sideways). NEVER block the vents by putting anything on top of the receiver (especially the cat). Don't cool it by pouring beer inside (most pubs seem to do this). It's a waste of good beer and it makes the cat sick. Immediately disconnect the mains. Remove the cover. Apply warm air with a hair dryer and continue for at least half an hour after the visible signs of water have evaporated. Do not overheat the unit; just keep it warm until all moisture has been driven out. Then leave it for at least an hour to cool down. Replace the cover and try it. If you spill coffee or Coca Cola or anything sticky then you must wash this away with a tiny amount of water followed by methylated spirits then use the hair dryer as described above. Be absolutely certain that no moisture remains before reconnecting it. There is no reason why not but remember that you have no way to adjust polarisation skew. You must use a standard 13/17v switching LNB in order to get both polarisations and the position of the LNB will be a compromise. It will give best results if the dish arc is limited to move between, say, Astra at 19.2'E and Eutelsat at 7'E. You will need a positioner unit to drive the actuator which moves the dish. You can build one by using a transformer which supplies 24 volts at 2 Amps through a bridge rectifier. A two-pole two-way switch (with centre-off position) is needed to reverse the polarity to drive the dish both east and west. Telepart can supply a suitable low cost mini positioner. Yes. Any earlier Amstrad satellite handset will work, although the button labels are different. You should be able to get an SRX200 or SRD400 handset very cheaply. (Q.25) Why do I see a flashing LED(s) ? If both LEDs flash see 8.7 and 8.8. If only one LED flashes, a timer event is set. Read your user manual to find out how to set and alter timer events. (Q.26) Can I upgrade to a 2 input tuner ? Yes. A tuner kit is available from SatCure and will give you 199 channels with a 2 input tuner. You will have most of the options of an SRD550, including 22kHz tone-switching. This conversion kit costs about £65 but that's cheaper than a new 2 input receiver! Yes. An Enhanced LNB will work with your SRD510 but all frequencies must be tuned 250 higher. You will not receive frequencies above 11.690 GHz. The higher channels will be missing. You can fix this by fitting the 199 channel kit and also a modified tuner. It has a twin-input tuner, which has an internal 22kHz tone generator, so it can control a Universal LNB. In addition, the tuner is a "wideband" one with a wide tuning range (I believe it will tune in Astra 1D with a standard 10.0GHz LNB). It has two card slots. In common with the SRD540/545, it has a slightly different power supply which is capable of providing current for two LNBs. The 24 volt tuning supply used in the SRD510/520 model is increased to 29 volts in the later one. In theory you MUST NOT swap power supplies between the two versions but, in practice, it doesn't seem to cause a problem except that you may see hum bars on the picture if you fit an SRD510 PSU into an SRD550 !! Also, the LNB voltage may be insufficient. However, it's OK to swap them for yesting purposes. How to modify an Amstrad SRD 510 to work as a standalone decoder. !! These modifications can be done by everyone with a very basic knowledge of electronic components. However, keep away from the power supply board and always disconnect the power cable before opening the case !! - Solder a short wire from TV Scart pin 1 (Audio out R) to pin 2 (Audio in R) and another wire from pin 3 (Audio out L) to pin 6 (Audio in L). This will allow the unscrambled audio signal to pass through directly. - The C/Ku band switch on the main pcb will be used to switch between decoder and IRD mode. Therefore, interrupt the copper track on the pcb that leads to the switch (on the C band side) close to the switch. Solder a screened cable with the centre core wire to the (now open) C band contact of the switch. Connect the cable's screen to TV Scart pin 17 (Video GND). Note: The C-Band switch contacts go open-circuit after a long period of non-use. Test it first! - Connect the other end of the centre core wire to a 12 kOhm resistor that is in parallel with a 47 pF capacitor. Connect the other end of this RC combination to Scart pin 20 (Video in) and make sure everything is well insulated. Close the case again. - Connect the SRD 510 (via the modified TV Scart socket) to your receiver's decoder Scart socket via a standard Scart cable. Set the switch (former C band switch) to "C" for the SRD 510 to work as a standalone decoder or to "Ku" to use it as an IRD (like it was before). >Further to my e-mail yesterday I have now purchased the Amstrad SRD510. >Gold', the picture is literally swarming with minute black and white dots. >These are *not* sparklies but something quite different. >anything I can do to reduce them? It sounds like decoder spots. This is to do with the "seed code" that the decoder uses to determine the precise cut and rotate point for each line. If it's a couple of pixels out, you'll see these "buzzing bees". The c & r seed value is determined by four jumper links inside the decoder box near the front edge. (Q.31) Why are the pictures dull? Amstrad decoders were made with a white plug on the two screened coax cables carrying video in/video out to a four-pin connector on the main board. Some decoders had this plug REVERSED and the main board socket was also REVERSED to compensate! The plug must be installed so that - looking from the front of the receiver at the 4-pin plug towards the rear - the wire colours from LEFT TO RIGHT are white-black-white-black. You may need to reverse the socket on your main board to achieve this. If the plug is inserted the wrong way round, the PNP SMD output transistor inside the decoder will be damaged, resulting in low contrast of all pictures. These programs are not encoded but they carry the "Videocrypt signature" code which tells any Videocrypt decoder that they *are*. So the decoder tries to unscramble the pictures and scrambles them instead! The simple answer is to disable the decoder. This is easy to do. Locate C293 (a 1uF electrolytic on the vertical daughter board). Disconnect one wire and the decoder will no longer work. Note: If you fit a switch you must keep the wires very short and you must not twist them together. Make sure that the wires can not come loose and touch dangerous parts of the Power Supply! End of Amstrad 510 FAQ. If you wish to keep a copy on your own WWW server, please tell me so I can include its URL on further editions. No further updates will be sent out via email (except in extreme cases) but will be posted to Usenet and updated on the above URL. Disco Dave (C9450929@pegasus.hud.ac.uk), Martin Craker (Martin@mcraker.demon.co.uk), Andy Pearman (pearmana@prl.philips.co.uk) Nigel Goodwin (nigelg@lpilsley.demon.co.uk). A complete fault-finding guide called "The Screwdriver Experts Guide" is available. This article is Copyright 1995 SatCure and Leigh Preece. This file may be downloaded for private and personal use but NO part of it may be published in any form without the prior permission of the authors.